Global unemployment is finally back to levels seen before the global financial crisis. But the recession has left a sharp divergence between advanced and emerging economies, according to a new gauge unveiled by the International Monetary Fund. The world’s jobless rate ended 2014 at 5.6%, where it stood in 2007. But global employment is growing at just 1.5% a year, far slower than the 2% to 2.5% growth rate seen before the crisis. The world’s top policy makers, convening through the G-20 and the IMF, have long used overall economic growth measures to assess their progress. But they often note that jobs are the key measure of their success. The latest gauge shows one way they’re struggling. Top-line measures such as unemployment are returning to normal levels in many nations, including the U.S., but overall employment growth remains sluggish. The new report shows a striking divergence between advanced and emerging economies. Unemployment in advanced economies–members of the Organization for Economic Cooperation and Development–stood at 7.4% in 2014, far higher than the 5.7% seen in 2007. The eurozone is largely responsible for that elevated level, with most economies other than Germany struggling to regain ground. Emerging markets have generally fared better on the employment front, at least according to official measures. 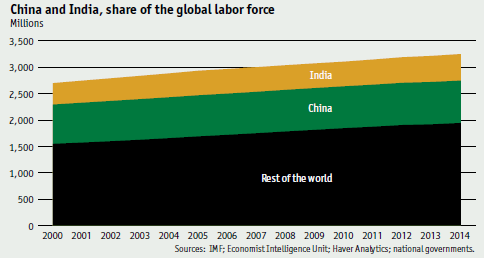 But the report notes that official gauges for China and India, which together account for 40% of the global labor force, are widely seen as too low. Substituting a measure of joblessness for those countries from the private Economist Intelligence Unit would put the global unemployment rate in 2014 just above 7%.